DNC rebukes Trump for mocking the disabled. Anastasia Somoza arrives onstage during Day 1 of the Democratic National Convention in Philadelphia on Monday. Last fall, in a campaign stop in South Carolina, Donald Trump imitated a New York Times reporter who has a congenital condition that limits the movement in his joints. “You’ve got to see this guy, ‘Ah, I don’t know what I said! I don’t remember!’ ” Trump jeered, jerking his hands around and distorting his voice. The Republican nominee for president is so awful toward so many individuals and groups of people that it can be easy to lose track of even his most grotesque insults. But this incident seems to have unusual staying power in the public imagination, becoming the basis of a recent ad produced by the progressive super PAC Priorities USA and of a video package shown at the Democratic National Convention. It is worth contrasting Trump’s casual cruelty with the tone the DNC has set on disability issues so far. On Monday, disability rights advocate Anastasia Somoza delivered a powerful speech in which she said she felt sorry for Trump. “I honestly feel bad for anyone with that much hate in their heart,” she said. 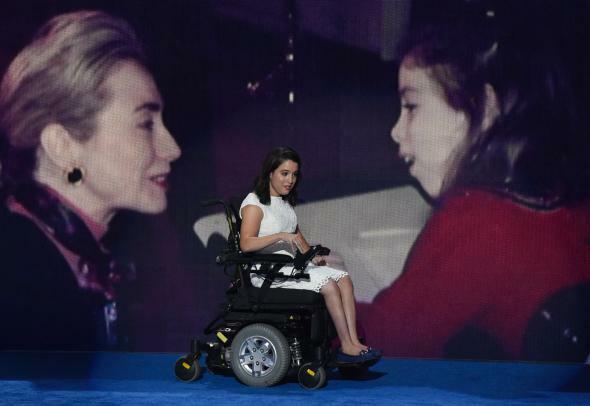 “Donald Trump doesn’t see me, he doesn’t hear me, and he definitely doesn’t speak for me.” Somoza, who has cerebral palsy and spastic quadriplegia, delivered her talk from a wheelchair to the roars of an approving crowd. Among the convention’s many grand themes so far—criminal justice, the economy, the folksy charisma of Bill Clinton—these occasional grace notes will hardly stand out. In any other year but this one, they would hardly be worth remarking on. But this is not just any year. Early in the evening on Tuesday, former Iowa Sen. Tom Harkin took the stage for a presentation on the ADA, which he co-authored and championed in Congress back in 1990. Harkin learned sign language from his older brother, Frank, who was deaf, and he took the chance on Tuesday to teach the assembled delegates one particular word. He led the crowd in taking their fingers and knitting them together, and then moving them in a circle. “That, my friends, is the sign for America,” he said. “It’s a beautiful sign. Think about it, we’re all together—we’re all together, no one is left out.” No one, that is, but Donald Trump.